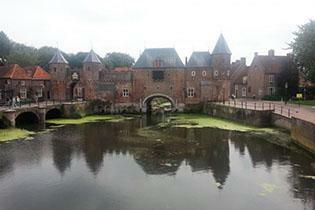 Soest is a small town north east of Amersfoort. There is a good shopping area and a nice market on Thursdays. The hill called "de Engh" is an beautiful area of farmland within the town. 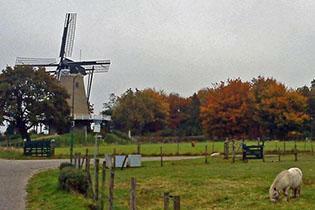 The windmill de Windhond (the Greyhound) marks the highest point. The exact origin of the name Soest is unknown but it could have meant well at the border of high and low ground. Towards Soest we cycle the high ground as we cycle through the Soesterduinen and surrounding woodlands in the northern part of the Utrecht Hill Ridge (Utrechtse Heuvelrug). 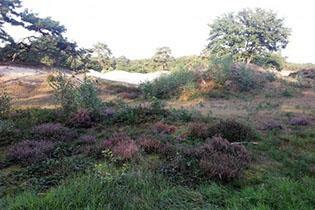 We'll pass dusty sand dunes, heath and woodlands. 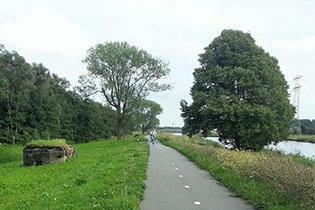 We cycle the low ground as we follow the river Eem from Soest back into Amersfoort. The river runs through beautiful farmland with grazing sheep and cattle. Along the river there are many bunkers which are part of Grebbelinie (Grebbe Line). The Grebbelinie was an 18th century defence system against foreign armies based on flooding large parts of the country. The bunkers date from just before the second world war when the Grebbe Line was once again fortified against a German attack.